Our Island Resort is one of the closest operations to the Panama fishing hot spots. Our premium fleet can reach the big game fishing grounds in a timely and conformable manner, giving you plenty of extra time to hook an exceptional marlin or tuna depending on the fishing calendar. Our Panama fishing trip captains speak english and Captain Chichi is regionally famous from San Diego to Panama, so check our fishing calendar and come for a rod bending trip of a lifetime. Located 48 nautical miles from the lodge, this area is one of the most unique fishing grounds in the world. Running five miles long and three miles wide, The Hannibal bank is characterized by deep water in addition to being a beneficiary of the Humboldt Current that moves an abundance of plankton biomass to the surface. As a result, the bank’s prolific food chain delivers trophy-sized yellowfin tuna—making this some of the best fishing in Panama. The 70 minute boat ride is worth the opportunity of hooking a huge blue or black marlin, sailfish, and trophy sized yellowfin tuna. Located 40 nautical miles from the Lodge, Isla Montuosa is an exceptional fishing ground. 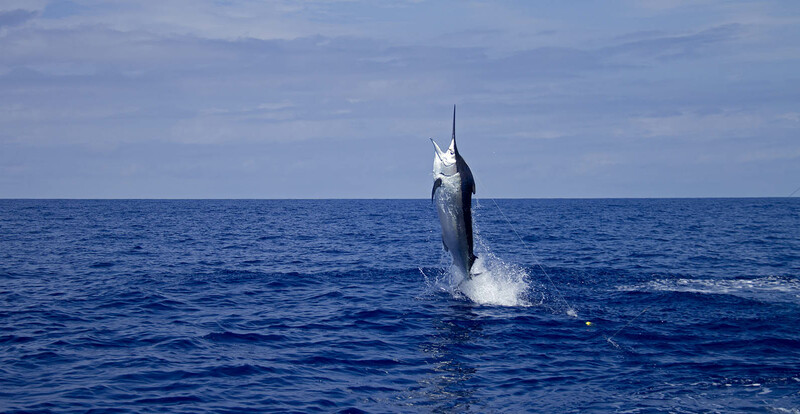 Near the steep undersea pinnacles, you can find black marlin, sailfish, and snappers. When it’s the right season, it’s common to hook yellowfin tuna of up to 200 pounds, as well as some absolutely monster marlin. Guests will pop billfish, tuna, broom-tail grouper, mullet snapper on this Panama fishing trip. With a name meaning “Thieves Island”, Landrones is an intriguing sight. A short 17 nautical miles away looms the green mountains that rise to resemble the shape of a lion on its perch. It’s also a prime location for scuba diving and sports fishing and is rich with cubera snappers, rooster fish, and various types of jacks and tuna. This timeless archipelago is a haven for live bait fishing. The lodge features world-class lure and live bait fishing action—only 15 nautical miles away! The ecosystem is known to be the home of white-tip sharks, rays, and turtles. The catch is rooster fish, amberjacks, wahoo, barracuda, as well as rainbow runners. This authentic escape is only 4 nautical miles from the lodge. The area is covered in luscious mangroves where snorkelers and fishermen enjoy the sights of sea turtles and dolphin swimming freely. Consequently, these fertile fishing grounds deliver amberjacks, cero mackerel, wahoo, barracuda, rooster fish, and rainbow runners.